With the turkey-in-the-oven season firmly upon us, I have been sipping a few Pinot Noirs. I mean, I’m totally doing research toward finding the right wine for Xmas dinner. It is completely out of a sense of duty to friends and family that I am tasting these wines. Right? Uh … right! So, putting shoulder firmly to wheel, I opened a bottle of this Turning Leaf. Notes: The color of this one was a light purple in the glass. It was light-to-medium in weight on the palate with somewhat low acidity and no tannins to speak of. With alcohol at 13% it wasn’t a completely dry Pinot but definitely not sugary. Flavors for me were sweet cherry and raspberry with dashes of pepper and just the slightest hint of earthiness. There was absolutely nothing to hate here, but there was nothing to bring me back, either. I mean, I think lower acidity can be nice in a Pinot Noir if it makes way for that silky, velvety mouthfeel some achieve. I didn’t find that. And with a lack of acidity and/or tannins, I’m not sure that this wine would pair extremely well with many foods. Unless … unless maybe you were having bread or soup in advance of a meat entree (beef or game) for which you are saving a hearty, tasty red to knock everyone’s socks off. Or, if you have other plans for dinner, it could serve as a simple, easy sipper while you wait for the turkey to finish roasting. Anyway, I picked this one up on sale for $5.99. At that price, although this won’t be my Xmas dinner companion, you might find it fits the bill for your celebrations. People are going to think all I do is drink wine. It’s not true! I have aspirations, mind you. Here is another bottle from my past being redeposited here for archival purposes. Not destined to be my favorite Chardonnay, this one certainly isn’t on the bottom of the list, either. It’s solidly in the drinkable range, especially for those who like California Chardonnay. I do, actually. Still, I prefer a little more acidity in mine than what I got from this Turning Leaf 2008 by E&J Gallo. But you don’t have to remind me! I’m not spending $20, $30 or more on a bottle. So …. Notes: Flavors on this selection are very restrained for a California Chardonnay. I tasted lemon-lime and honey, some light toasty oak notes, butter and allspice on the finish. It wasn’t very crisp for a dry Chardonnay – almost fatty on the tongue (thus the butter, I suppose). Light though it was, the flavors did manage to come through a meal as well. Lest I forget, I found citrus and apple aromas in the bouquet. Important: I am not a professional sommelier or wine connoisseur. See “About” for the full disclosure. Originally posted June 2011 at Blogarhythms. Another inexpensive Chardonnay for consideration. 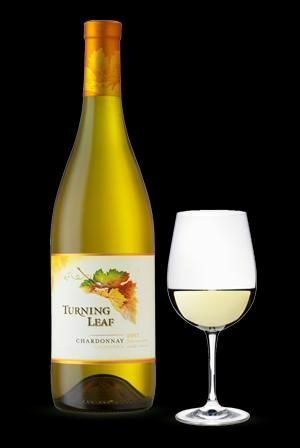 Notes: This Chardonnay from the ubiquitous Turning Leaf vineyards is surprisingly deep golden in color with a ripe (I’d even say baked) apple flavor base. There is a light citrus note and spice along the way ending with just the slightest hint of a grassy bite. Not a bad wine at all. But because I’m not really a huge fan of baked apples, this will probably not be a repeat buy for me. If you like ripe/baked apples, go for it. You could certainly do much worse for the price.